It’s time to decide: Will you be an agent of depletion or regeneration? There’s a vast revolution underway. And it’s time to pick sides. Your choice couldn’t be more critically important. Quite possibly, the entire fate of the human species hangs in the balance. For many centuries, humans have consumed the natural resources around them at a rate far faster than the planet can replenish. Until recently this didn’t pose an existential problem, as fresh deposits could be tapped through the discovery of new continents or development of new technologies. But those days of living beyond our means are now over. No sizeable unexplored territories remain on the globe. Technology (NYSEARCA:XLK) is only helping us burn faster through the increasingly dilute deposits that are left. The planet’s population and its demand on key resources is ballooning, causing the natural systems we depend on for life to falter. Yes, the situation is dire. But it doesn’t have to be this way. A better future is possible. It’s up to us to make it happen. There’s plenty of evidence of working real-world models that show exactly how we can improve the planet for future generations. I’ll focus on a few in a moment. But first, it’s critical to understand that working against adoption of these better practices is our society’s entrenched system of extraction, otherwise known as the Business As Usual (BAU) crowd. This includes every person and entity busy protecting or promoting (usually from a position of profound ignorance) the concept of exponential economic growth as a necessary and good thing. Complicit are all major parties of our political systems, the mainstream media (MSM), and of course the entire financial system — especially all the world’s central banks and their main clients. This isn’t even a David vs. Goliath story; it’s more like a krill vs. blue whale story. Trillions of dollars are spent advancing BAU while small, usually independent operations lean against that hurricane-force headwind. The good news? We have data and logic on our side. As well as something more important: The chance to create a life worth living and a world worth inheriting. Ideas are very powerful things indeed. They are force maximizers, and we have the ideas on our side – mainly because the ‘ideas’ of the BAU crowd are not ideas at all, but relics of a bygone era rooted in a sloppy mix of false beliefs. For ten years now, I’ve been busy sharing with anybody who will listen the stark data that shows our current approaches are utterly, completely, provably unsustainable. These are very odd choices for a supposedly “rational” species to make. However, humans are rationalizers, not rational, especially when organized in large, political groupings. Which is how we’ve ended up with the above list. Now, onto the main point of this piece: The questionis not Will the system collapse?, but When will it? Wherever I look in the data — be that with the Economy, Energy or the Environment — all I can find are clear examples of practices that will someday stop. Once the water is drained from an aquifer, that’s that. Full stop. It’s not going to re-fill again on any timeline that matters to us or our progeny. Once the fossil fuel-derived fertilizers we’re using are no longer available to spread on our exhausted soils (now dirt), food production will plummet. And that will be that. Once our currency system collapses under its debt burden, only one thing will matter at that point: Who’s going to eat the losses? Once our ecosystems collapse, they will not come back in any meaningful way for a very, very long time — a time frame that will likely outlive our species. And so on through a very long list of current practices that will have to change. Our choice then is whether we want to change on our terms, or reality’s. Voluntary simplicity is manageable. Involuntary simplicity is brutal, at best. We just haven’t decided to discard our BAU ways yet. Said differently: we can either be agents of regeneration and abundance, or we can be agents of extraction and depletion. We are choosing to be the latter. We know how to build structures that can last hundreds, even thousands, of years which require almost no energy to operate. We know how to farm in ways that build soil to incredible depths and richness — far faster than nature could ever accomplish alone — and grow high nutrient density food for ourselves. 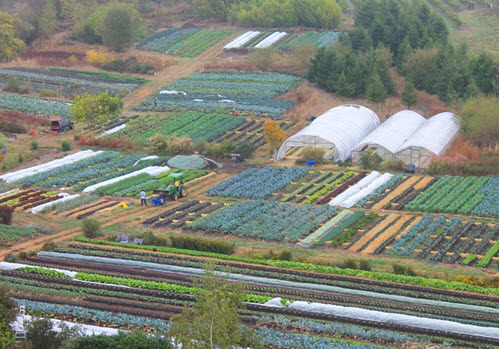 Singing Frogs Farm in Sebastopol CA is a leading example of this, and I’m a huge fan of theirs. We’ve shown that no-till vegetable production is not only possible, but can be highly productive and profitable. We’ve quadrupled our soil organic matter, without nutrient leaching, while nearly tripling the total microbial life in our soils. We’ve increased bird and native bee populations and diversity. We’ve increased native perennial plant diversity and density. We’ve dramatically reduced water usage per crop, and we’re producing roughly $100,000 in vegetable sales per crop acre per year with over half of that revenue paying our year-round employees’ salaries. There’s nothing but incredibly positive outcomes offered by following Singing Frogs’ farming practices, which a dozen or more small farms have done with similarly positive results. Singing Frog’s founding farmer Paul Kaiser presented at our recent (sold-out) Peak Prosperity seminar, and his co-founder and wife Elizabeth led folks on an extensive tour of their farm afterwards. Such tours are highly encouraging because they show what’s not only possible but proven to work. They’re also disturbing, though, because these provably better practices are still very uncommon. A big surprise to those who study Singing Frog’s “no-till” farming practices is learning that even so-called ‘organic farming’ is quite often still extractive in nature because it mines the soil rather than building it up. The main culprit? Tilling. Disturbing the soil is, as Paul told us, “like an earthquake, a hurricane, a tornado and a fire” for the soil organisms. Yes, tilled organic farming is still better for the planet than conventional agriculture, but it’s a far cry from the no-till methods employed at Signing Frogs Farm. I grew up thinking freshly tilled soil was a normal part of healthy farming, but that could not be further from the truth. The data is in. Tilling is a practice that turns soil into sterile dirt. Do it long enough, and all you have is lifeless dirt with very low organic matter, low macro and micro nutrients, and vastly reduced soil biological activity. But as the Kaisers show us, we can farm regeneratively. They show us a better model from a lifestyle, ecological and economic perspective. The operative question is: Why aren’t we doing this in a more wide-spread fashion already? The answer is because we’re humans, and we tend to change our ways slowly, often resisting change altogether. Like the ahead-of-the-curve health researchers telling us 20 years ago that the “low fat” approach to dieting was junk science (which it has now been proven to be), Paul and Elizabeth Kaiser are similarly armed with irrefutable data and are a few decades ahead of the curve. That’s a sad thing because we desperately need to be adopting regenerative practices as rapidly as possible. In many cases, our choice is between embracing fiction or reality. In Orwellian fashion, the mainstream media (MSM) often promotes fake data even as it decries the rise of fake news. Seemingly the MSM can no longer distinguish fake from real. Bluntly, the old system is broken beyond repair. Anybody with a semi-intact ability to reason, a strong stomach for wading through disturbing ecological and/or economic data, and access to the internet can determine that. The paradigm of endless growth on a finite planet is old and busted. It’s just a dumb idea that isn’t going to work for much longer, and we can either end it on our terms or let Mother Nature end it on hers. If we wait much longer, we risk collapsing our ecosystems — and then it becomes “game over”, perhaps for our entire species. The utterly ridiculous idea of constantly compounding our debts at twice the rate of our underlying economic growth will also end, probably in with a lot of widespread losses and pain. Economically, just as ecologically, we face a choice between either voluntary austerity or involuntary austerity. The former is doable but tough, while the latter is rough and brutal. Just ask the people of Greece. Or Venezuela. Hopefully, one thing we can look forward to is the long era of central planning to finally come to an ignominious end. The world’s central banks have done their best to defend a system of infinite exponential growth in debt, which never should have been put in place to begin with. [Our institutions] aren’t failing all at once. A pension system here, a small country’s hyperinflation there. But they are failing. In short it is that the most important knowledge, that of time and place most relevant to individual actions, is unknowable to the central planner. And that propagates errors in policy which ultimately is capital destructive. It is why global debt is out of control. It is why the central planners made the Faustian bargain with the banking cartel to create debt-based money to fund their Utopia. The Marxists get wealth redistribution but at the cost of the banks’ vig. As we approach the moment where we finally reach the end of the societal road paved with debt these institutions will fail more rapidly. Cultural Marxism is, like all collectivist ideologies, Utopian. By divorcing intentions from consequences it not only insulates itself from criticism but sells itself as a path to higher plane of spirituality which it can’t deliver. It justifies ends with means that are abhorrent and, like all psychopaths, blames its victims. A system rooted in a bad idea, compounded by the conceit of central planning, is not just destined to fail, but fail spectacularly. The worry many of us have is that the failure won’t come soon enough. It will only come after the last whale has died, the 10th billion person is born into a world of plummeting farm yields, and Venezuela-style social anarchy visits every country. I am one those hoping and praying that the eventual correction comes sooner than later. I fervently hope the lesson is painful enough that we can finally admit that central planning is a terrible idea. And that we start pursuing better models. I’m an avid outdoorsman and spent an enormous amount of my time outside as a child. I could catch or find practically any critter that lived nearby. I observed, and with my own eyes I can tell you that the insects are nearly gone, with the larger beetles and moths now almost entirely missing from the porch lights at night. No insects hit my windshield anymore, even on long drives though the country during the height of summer. Life on Earth is being killed. Nearly every large species of animal is in danger of going extinct — that’s not just something you can frown at, shrug, and continue on. Our ecosystem depends on all of these species playing their role — without them, the systems we depend on to live collapse. So the race is on. This is for all the marbles. The Powers That Be would like you to be amazed and entranced by the higher stock and housing prices their thin-air money printing have created over the past decade. All so you’ll borrow and spend more. They’re trying to get you to maintain your faith in two broken ideas; (1) the world is infinite and (2) being a debt serf enhances your life, rather than detracts from it. Young people are rejecting these lies in droves. But older folks, which much more money to lose when the status quo falters, are busy frantically pretending the system is fine and defending it with every diversionary trick in the book. But these new models of regeneration continue to spring up, however small they are right now. And, in the long run, they will win out. Why? Because we will need to embrace them — sooner or later — to stay alive. So, what can you do to become an agent of regeneration? Buy less. The less “stuff” you require to be happy, the richer you are. Eat better. Preferably from organic local sources, even more preferably from small-scale farmers that nurture their soil. Even better, grow some of your food on your own. Be prepared for crisis. Be it a natural or economic disasters. Cultivate sustainability. Bring respect for nature back into your life. But the key element is to get started now. Time is short in this story. Only those actions taken in advance will offer any protection from the inevitable pain when society’s unsustainable systems start collapsing in earnest. In Part 2: The 4 Essential Practices To Adopt Right Now we offer specific guidance in the most important steps you can and should start implementing in your life today. Each increases your regenerative impact while simulateneously enhancing your quality of life and offering substantial protection should crises ensue from the failure of our BAU complex.